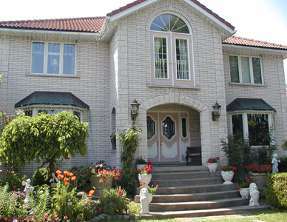 The Villa Alexandrea is a classic Mediterranean Bed & Breakfast in Niagara Falls Ontario. Located along the Niagara Gorge near the Rainbow Bridge, providing guests easy access to and from Niagara Falls, USA. Also, this Niagara Falls Bed and Breakfast is only a short walk to Casino Niagara, Clifton Hill and all the excitement at the Falls. The entire house is smoke free, air conditioned, and feature cable television and wierless Internet in all rooms. A balcony and patio is on the seond floor of the Bed & Breakfast, providing a stunning view of the piteresque Niagara Rover and Niagara Gorge. Enjoy a taste of Italy in Niagara Falls through this Mediterranean-style Villa! The Villa Alexandrea is situated along the Niagara River and Niagara Gorge. The sound of the majestic Falls can be heard from the yard of this Niagara Falls B&B. The main foyer greets guests with warm ceramic tiles and an oak wood Scarlet O’Hara staircase. Up the satircae is the upper balcony and patio, which overlooks the beautiful Niagara Gorge. On the second floor is a Murano glass chandelier from Venice. Our garden is adorned with statues and fountains among an endless display of colourful flowers and plants. A short walk along majestic Niagara River will take you to the Falls, Niagara Parks Attractions and wonderful Niagara Restaurants. This luxurious B&B is only a short drive from the historic Niagara-on-the-Lake, wine district and all the golf courses in Niagara.